There are no classes with Naomi on Good Friday and Easter Monday but if you’re looking to practice some yoga during this period, you can visit Bristol Yoga Centre as some of their classes will be running. We’ve also arranged Mindful Yin Yoga Workshop with Emilia on 27th April 2019. See here for more information. I hope you have a lovely Easter weekend! Sorry there are no classes on Bank Holiday Monday 27th August 2018. Naomi is away on holidays from 28th August until 4th September and has organised cover for her classes while she's away. Bristol Yoga Centre has organised some yoga workshops and courses in September. For example, Yoga for Stamina with Travis on 8th September and a comprehensive 10 week yoga course with Amber on 'living with uncertainty and change'. These classes are suitable for beginners as well as more advanced students. I hope your enjoying summer time! My yoga class at the Redland club is moving to Bristol Yoga Centre from 20th November 2017. The lunch time yoga class will be from 12:30 - 1:30pm on Mondays. This class was originally held at the Relaxation centre for many years and moved when the centre unfortunately closed down. We had a nice couple of years at the Redland club but it's time to move on! I hope to see you in our new class! Spend an afternoon deeply relaxing and releasing in this wonderful 2 hour restorative yoga workshop with Naomi at the Bristol Yoga Centre. We will practice rejuvenating breathing techniques and some deeper yin postures to release held tension. There will be lovely long Savasana (relaxation) and a short meditation practice. Places will be limited to 12 students to give you maximum attention and guidance. Price: £25 (£20 concessions). 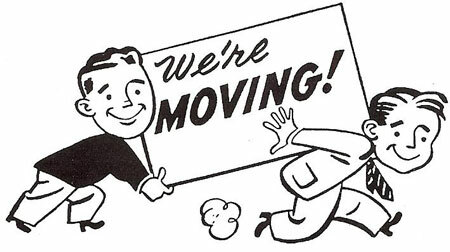 Move GB students are welcome! Next week is the beginning of a new autumn 8 week term at the Bristol Yoga Centre. I have five lovely classes at the studio. All of the classes are suitable for beginners as well as more experienced students. Bristol Yoga Centre also has lots of other classes such as Ashtanga Yoga, Vinyasa Flow Yoga, Gentle Yoga, Yoga for Backs, Yoga for Sports, Pilates, Scaravelli Yoga and many more. You can come as a drop in student or join the class any time. See here for more information on class fees. Come and learn how to release tension in the neck and shoulders in this enjoyable 2 hours yoga therapeutic workshop at the Bristol Yoga Centre. I will show you practical ways of freeing upper body tightness using proven yoga techniques such as Pawanmuktasana (joint freeing) movements, asana (yoga postures), breathing practice and relaxation techniques. Price: £25 (£20 concessions) MoveGB booking accepted. Good news! All of my classes will run as usual during the summer except on Bank Holiday Monday 28th August 2017. 7 week term starting next week at the Bristol Yoga Centre. I currently have 5 classes on Tuesdays and Fridays and most of the classes are available on MoveGB. Here are list of all my classes the Bristol Yoga Centre. Signing up for the term is the best way to do yoga as it will encourage you to attend regularly as you have paid up front. Plus, in Bristol Yoga Centre you can do 2 class swaps within the term so if you need to miss one or two classes in a term, you can arrange to go to another class within the term. See here for more information on class swaps. You can also do drop ins and purchase multi class cards at the studio. 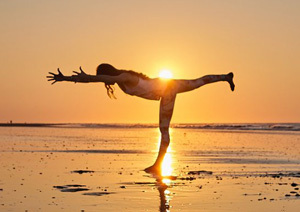 If the day doesn't suit you, there are other great yoga and pilates classes running there too. All the teachers at the Bristol Yoga Centre are highly qualified and experienced and we have many different styles and specialist classes available. See the timetable for more information. To celebrate our opening, we thought we’d run an Open Week. From 8th – 13th May we’ll be running lots of free classes. It’s a great opportunity for anyone who’s never tried Yoga or Pilates to come along and give it a go. So if you’ve always wanted to give it a try … then now’s your chance. See our Open Week page for full details on how to get involved. Be sure to book in advance as we expect places to disappear fast! We are running a prize draw and giving away some great stuff. The top prize is £48 voucher for the studio. This will enable you to go for a one-to-one session with one of our brilliant teachers. This will provide a great chance to focus on any areas of your Yoga or Pilates practice that you would like to improve and help move your personal practice forward. Visit our competition page for details on how to enter. There are no yoga classes running on Good Friday 14th & Bank Holiday Monday 17th April 2017. Also this year, I have decided not to continue running my classes at the Bristol University gym over their Easter holidays. Normally, I run these classes even when most of the students are away on their breaks, but I've taken the opportunity to concentrate on setting up my new yoga studio. So the Bristol University classes on Mondays 4:30 - 6pm & Wednesday 12:30 - 1:30pm are closed between 3 - 19th April. The classes will restart as usual from Monday 24th April 2017. I hope you have a lovely Easter holidays! 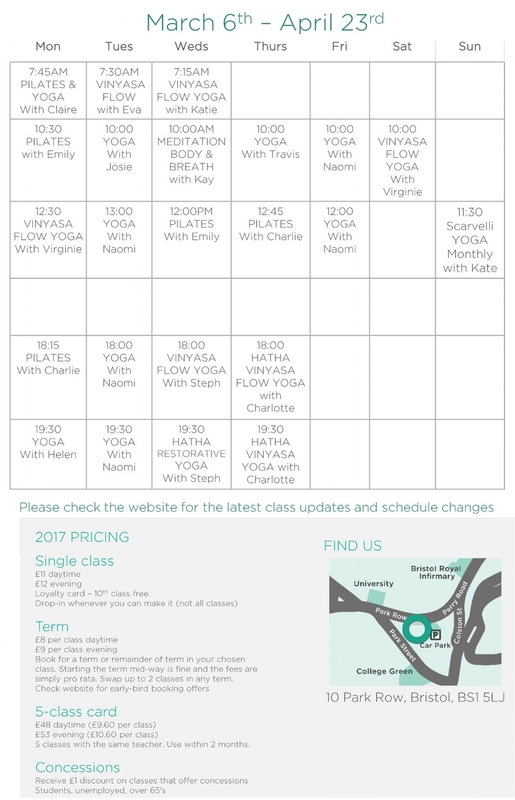 I thought it might be useful to post the timetable for the new yoga studio. This is for the Spring term 2017. Although the classes operate on a termly basis (cheapest option), it's actually possible to join any time. We also accept drop in as well as offer 5 class card which are valid for two months. Most of the classes are also listed on MoveGB too. Please note that 2 hour Scaravelli Yoga session on Sunday with Kate is a monthly class. Next date is 12th March. The following dates are as follows: Sunday April 23rd, May 21st, June 25th 2017. All the teachers at the studio are highly qualified and experienced and we look forward to having you in our friendly and fully equipped studio.